It might not be a pirate’s life for you and me, but there’s plenty of pirates pillaging the high seas. If you don’t believe me, you can check out the International Chamber of Commerce’s Live Piracy Map, where you’ll see where these incidents are taking place, when they’ve taken place, what sort of ship was involved, and what the crime was reported to be (attempted, boarding, hijacking, even fired upon!). If I were you, I’d cancel that pleasure cruise to Somalia, as Somalian pirates have captured 7 vessels in 12 days! 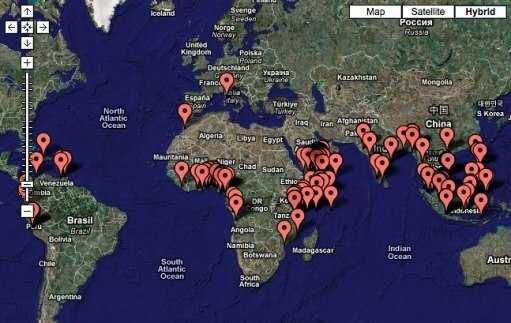 The ICC Piracy Map is the brainchild of the International Maritime Bureau. Amazingly, hijacked vessels had no one to report the crime to, other than local law enforcement, until 1992, when the Piracy Reporting Centre was established. The PRC issues a weekly piracy report, piracy warnings, maintains the live map, and even issues reports on suspected pirate vessels so other freighters in the area can know who to avoid. This just goes to show you that no matter how you ship things, from freight to rail to ship to air, there’s always someone willing to try and steal it. I had no idea piracy was so bad still. I had assumed, I guess wrongly, that big vessels were safe from boarding. That just goes to show you that there’s no limit to the brazenness of modern pirates.